Thurs 1st Feb – Cake Sale, Mrs Dunn (US) raised £127.51 which was spent on books for the class library, card games for wet playtimes and a subscription to Aquila magazine. Thurs 11th Jan – Cake Sale, Mrs Woolston/Mrs Gregory (US) raised £110.55. Saturday 2nd December – PTA Christmas Fayre 12pm – 3pm was a great success. £3700 was taken on the day across all the stalls. Profit figure to be confirmed. 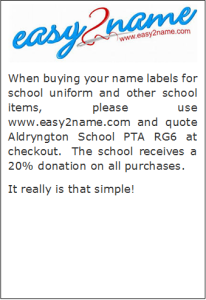 Friday 1st Dec – PTA Non School Uniform raised £261.60. Thurs 30th Nov – Miss Saunders Cake Sale raised £97.43. November – Christmas Puddings raised £TBC. Thurs 9th Nov – Mrs Culham’s Cake Sale raised £110.56. 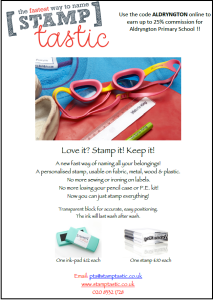 October – Personalised Christmas Cards generated 95 orders, income of £913.45 of which £225.40 was profit for the PTA. 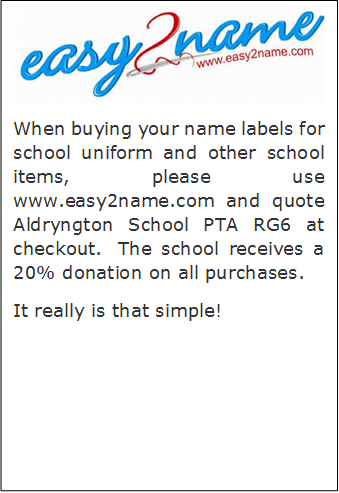 Fri 20th Oct – Bag2School Textile collection raised £238. Thurs 19th Oct – Family Lounge raised £118.56. Thurs 5th Oct – Cake Sale, Mrs Coleman/Mrs Smith (LS) raised £123.80, and was a complete sell out. The class decided to spend their money on … a special gold star cushion for their ‘star of the week’ child, Special pens, Star wars figures, Secret Seven stories, Wooden train set, Playmobil spaceship, Dolls and a Traditional bingo game. Thurs 20th/Fri 21st – Tuck Shop raised £133.00. Thurs 6th July – Miss Alberti’s cake sale raised £111.91. Fri 23rd Jun – PTA 2 pence pictures collected £267.50 the highest amount since we can remember! Thurs 11th May – PTA Disco took £917.47 on the night and the Parent Creche had takings of £151.19, both are subject to costs. Thurs 27th Apr – Cake Sale Miss Nowell (FS) raised £102.10. Wed 29th & Thurs 30th March – PTA Easter Egg Hunts – lovely sunny days with 269 children taking part across the two days (numbers up on last year which had 226 children entered), total profit this year is £274 compared to £203 in 2016. A parent has also applied for match funding giving us a profit of £534. Jan & Feb Ad-hoc 2nd hand uniform sales raised £65. Thurs 9th Feb – PTA Disco, takings were £1,038.35, after costs have been removed this works out as a profit of £574.35 to donate to the Air Ambulance. Thurs 9th Feb – Parent Creche, after costs saw a profit of £176.80 to donate to Air Ambulance. Christmas fayre raised £2710.38 from the day, plus a further £2100 match funding provided by Vodafone and £300 match funding from Sky. 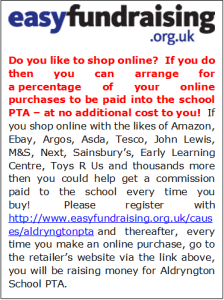 In addition to the various events organised throughout the year by the PTA, there are several on-going initiatives all aimed at raising more money towards equipment and activities for all the children of Aldryngton. 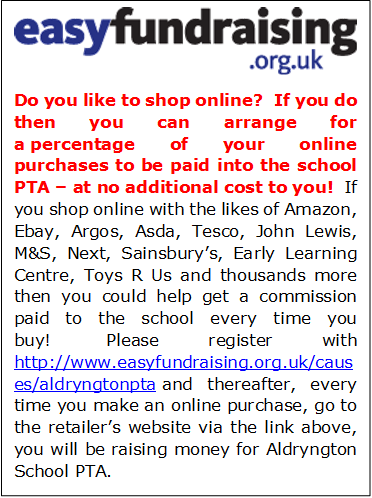 Below we have provided information on various other ways you can easily help raise funds for your school. Matched Funding is a scheme which lots of employers offer, please click on the link to find out more and/or contact your HR department for details … Matched Funding.